Gym Mirrors - Dance studio mirrors. In dance studios, fitness studios and many other practicing rooms, even home gyms, complete walls can be equiped with full sized mirrors. Installing a full sized mirror can be done by gluing the panels to the wall or, and that would be the best way to do it, by mounting them in a mirror profile. The mirros are placed in a special profile that holds the panels, no gluing is needed and this way the complete wall can be moved later and/or easily repaired. If one panel is broken we dont need to do heavy demolition work or even re install the entire wall. Quick easy and most important; cheap. The mirrors are equiped with a very tough safety foil. The foil we use is made plastic that is reinforced with strong fibers. This way, the mirror still can break when brute force is used but it wont break down in sharp pieces that could cause serious injuries. The mirrors will stay standing upright in the profile and can be easily removed in one piece. If great safety measurements are required we can mount the mirrors, completely glued on wooden panels. We place the mirrors in a special aluminium profile, one at the bottom and one at the top. 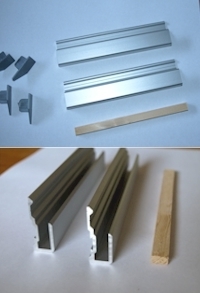 The bottom profile is best mounted directly on the floor or a skirting board. We can mount the complete wall 'floating'. But only if the material the wall is made of is strong and capable of holding the weight, like concrete, brick or even strong wooden walls. In all cases, it is necessary that the wall is straight and without any irregularities. Mounting a full sized mirror by simply gluing the mirror panels to the wall is not recommended and should only be considered if any other mounting option is not possible. A huge disadvantage is the moving part. Once glued to the wall the mirrors cant be taken down and even repairing a broken part is very difficult. The damaged panel has to be taken down by smashing it which could lead to damaging a panel directly next to it. No standard measurements! You tell us how big and we will make it! Custom made mirrors. You will find your mirror wall at Vision2Form. Mirrored wall case examples ».